This was the question that I recently posed to several priests: why aren’t more masses being offered ad orientem? As we have seen numerous books and articles in recent years convincingly argue for a return to ad orientem worship, it is unfortunate to see how few priests have actually returned to the traditional orientation. Despite well received scholarly works by Monsignor Klaus Gamber, Fr. Uwe Michael Lang, and Joseph Cardinal Ratzinger arguing in favor of it, few Catholics ever see the Novus Ordo offered ad orientem, with the notable exceptions of two dioceses: Arlington (Virginia) and Lincoln (Nebraska). 1. There are still priests who incorrectly believe that the Novus Ordo should only be offered versus populum (facing the people); often this is argued by referencing the General Instruction of the Roman Missal (GIRM) #299. There are also priests who, while understanding that the Mass can be offered ad orientem, believe that the “spirit” of the modern liturgy argues against it. As one diocesan priest reminded me, the quality of seminary formation (as it relates to the liturgy) has been quite poor for decades. 2. Some priests truly think that facing the people is a good thing. They contend that it brings people closer to the Mass because it lets people see what is “going on”. Unfortunately, there are many who have likely accepted the false narrative that offering the Mass ad orientem amounts to the priest “turning his back on the people”. 3. At the same time, there are priests who tend to be conservative regarding faith and morals, but who are either uneducated on the subject or simply disinterested in matters regarding the sacred liturgy. While these priests will try their best to offer a reverent Novus Ordo, “hot button” topics such as the use of Latin, Gregorian Chant, Communion on the tongue, and ad orientem are either ignored or viewed as unimportant. 4. Then there are the true “progressives” who have welcomed these changes to the Church’s worship, and who now hope to see doctrinal changes too (lex orandi, lex credendi). 5. Finally, there are priests, often ordained in the last ten years and with some exposure to the Latin Mass, who would offer more Masses ad orientem but are simply afraid to. Some fear the reactions of their parishioners; some that of their brother priests; most often, however, it is their bishop who they fear. Sadly, there are still dioceses where any semblance of liturgical “traditionalism” is strictly verboten. In the short-term there will be no widespread change, no return to the historic liturgical orientation of the Mass, without it being mandated either by Rome or the USCCB. Of course no one expects this to happen. Unfortunately, regardless of what Cardinal Robert Sarah might say in interviews (in his capacity as prefect for the Congregation for Divine Worship), or the liturgical examples given by both Pope Benedict and Pope Francis on several occasions, nothing short of a mandate changes the current environment. So, are those of us who recognise the theological and liturgical importance of this matter simply left to despair? Thankfully, the answer is no. What we can do now is to continue encouraging our priests and bishops who know the significance of liturgical orientation to renew their effort to reform the rite. In the past I have written about liturgical game changers as well as those elements of the Liturgy which help to restore a sense of the sacred. It is interesting to note that, as far as the faithful are concerned, this matter of ad orientem worship might be the easiest change to implement. Several priests I spoke with said that integrating more Latin into the Novus Ordo Mass, or reintroducing traditional hymns (or sung Propers) to their parishes, was a much greater source of conflict. In many places, parishioners are more vested in their seventies folk hymns and Haugen and Haas music than the direction of the priest during the Mass. Likewise, the reintroduction of Latin has at times resulted in greater pushback, as many Catholics incorrectly view the Novus Ordo as the “vernacular only” Mass (an idea declared anathema by the Council of Trent). Priests who already offer the Mass ad orientem told me that the faithful (by and large) accepted the change following targeted catechesis, both through homilies and bulletin inserts. This isn’t to say that some parishioners didn’t leave; rather that their departure was offset by the arrival of new families intentionally seeking the sacred. In addition, the change was at times preceded by a return to male only altar servers, kneelers brought out for Holy Communion, and a general overall return of reverence. In some cases the introduction of ad orientem was made during an abbreviated liturgical season such as Lent or Advent, and often with daily masses at first. So much of Pope Benedict’s papacy was directed toward implementing authentic reform and renewal versus the discontinuity and rupture so widespread in the decades following the Council. In the liturgy of the Roman Rite there may be no greater visual representation of discontinuity than the near universal abandonment of ad orientem Masses in the Novus Ordo. Conversely, there may be no better way to immediately begin restoring a sense of liturgical continuity than for the priest to once again face the liturgical east together with the faithful. Let us dare hope that, as more holy priests and bishops take this into consideration, we might begin to see more Masses offered ad orientem. Posted on February 17, 2016, in liturgy and tagged ad orientem, mass facing the altar, novus ordo, versus populum. Bookmark the permalink. 30 Comments. The Novus Ordo is a contentious liturgy. It’s easier for a priest to say a TLM than to reform the Novus Ordo. But then if we are talking about reforming the Novus Ordo, what about all the other elements that were deleted from the liturgy? The prayers at the foot, the offertory prayers, the last gospel, and so on. You’re comment about bringing kneelers out for communion is interesting. Because what we really should be doing is rebuilding the Altar Rails not merely wheeling in temporary kneelers. That’s what the reform of the reform is, a temporary solution. The permanent solution is to return to the Rite of Mass Klaus Gamber admitted had been destroyed. I’m with you brother! Have done most of what you said. Kneeling option for communion, Latin parts, ad orientem, permanent pew missal. The biggest problem has been getting musicians to switch to traditional hymnal. All my adult musicians have quit. The only ones hanging on are the teenage girls. They think the songs and latin are beautiful. Had people leave and there is population decrease in area so no “fill-in” They are worried about funding the school and since we don’t charge tuition, only think of the Sunday Mass as the fundraiser for the school. Can’t even bring up male only servers. Have already been threatened to be removed so probably have to stop going any futher. I’ve been taking it slow. Introduced it all with instruction over 4 years. Now will be sent to new parish to start it all over again. God’s will be done! Father, thank you for all you do and continue to do. Please find strength and consolation in the fact that your efforts, sacrifices, and trials must be pleasing to Our Lord. Pax. At first I thought this sort of thing did not matter, but I’ve gradually come to realize it does matter. I only came to realize it’s necessity through a desire to learn what exactly the Mass is, which I realized I did not know as much about as I should. It has been frustrating to learn more due to the lack of resources and lack of attention on the parish level. I still have much to learn, but I know enough now to know that if Catholics knew what the Mass is and what takes place, they would never even think about leaving. They’d want to attend more than once a week. Sometimes I wonder if it might not be more beneficial to stop all other classes at the parish, including CCD and RCIA and bible studies and just offer one, good, clear, solid and thorough course on the Mass for a year. Of course my reply is prejudice due to my age. But I dislike standing and having, who knows, hand Communion into my hands. I dislike short homilies. So what if people get tired of listening. I also know that there are many people but I want to kneel and have the priest dip the Host in the Wine and put on the tongue. But I’m 73 what do you expect? I never liked the new changes or churches built like auditoriums. Virginia Lewis: The priest does not “dip the Host in the Wine”. I’m 80, and if he is using the intinction option, he dips the Host in the “blood”. Excellent article, perhaps the title might be: Why are so few Masses offered ad orientam? Just two related brief points: why aren’t the Apostolic teachings of Pope St Pius X regarding plainsong rarely if ever seen in force? And why were the repeated affirmations of this from the II Vatican Council and Pope (St) Paul VI such as the little book Laus Deo he sent to every Catholic Bishop not in evidence? It seems you need a little reading of St. Thomas Aquinas, especially on the “direction” God is located. One could make a good argument that Priests should celebrate Mass on their backs looking UP (as Scripture describes God’s location). Thank you for comment Fr. Higgins. I don’t recall St. Thomas Aquinas writing against facing the liturgical east (ad orientem worship). While no doubt God is all around us, within the Mass itself Catholics faced east, particularly during the Roman Canon. Historically, the idea of the priest and people facing each other during the great Eucharistic prayer was non-existent…until Martin Luther came along and sought to destroy the Catholic Mass. While I cannot think of any instance in which St. Thomas Aquinas condemned facing away from the people at Mass I do know the he understood that God was not only “Everywhere”, but infinite and unlimited. He was certainly not a pantheist, as “God is everywhere” would suggest. He (God) is truly present in the Eucharist and all of the Sacraments, in the Inspired Word of God in Scripture and in the Body of Christ, which is the entire Church. I do not see any reference to God being more specifically in a wall than in the Body of Christ, the Church. Also, comparing an Ecumenical Council of the Church to Martin Luther seems a bit odd. I do not recall either Martin Luther nor the Second Vatican Council trying to destroy the Mass. I also do not believe that the Mass can be destroyed. I’d sooner believe Jesus who promised that the Church (which is soundly built on the Rock of Peter and upon the Eucharist and other Sacraments) will never be destroyed. The gates of hell shall not prevail against the Church. That’s guaranteed. I don’t understand how facing people during Eucharist could possibly destroy the Mass. It seems that some folks could believe that Mass can be destroyed. Don’t count me as one of them. Quite a bit for me to address in your reply Fr. Higgins, but all good points to tackle. First, regarding St. Thomas Aquinas, my point is simply that neither he (nor any of the saints) questioned ad orientem worship. Facing the liturgical east (in other words the altar) in no way disputes the idea that God is in Scripture, or the congregation, etc. ; it simply recognizes that within the Holy Sacrifice of the Mass itself, we face God together, facing east (or liturgically east if not actually east). The priest no more “faces a wall” when offering the Mass ad orientem today than when it was offered ad orientem for the first two millennium of Christianity. Regarding my reference to Martin Luther: I never brought the Second Vatican Council into this discussion, just as the Council never suggested versus populum masses. It was a post-conciliar innovation that was never called for in Sacrosanctum Concilium. My reference to Martin Luther actually comes from a Fr. Joseph Fessio S.J. quote regarding liturgical orientation. Also, Luther and the sixteenth centuries “reformers” introduced several practices which intentionally challenged the theology of the Mass: ad orientem was traded for Mass facing the people, the vernacular replaced the liturgical language of Latin, and communion was distributed in the hand instead of on the tongue. My reference to the “destruction” of the Mass applies to those European towns and even countries that killed Catholic bishops & priests, smashed altars, and confiscated Catholic churches during the “Reformation”. You and I are indeed on the same page regarding Our Lord’s promise to Saint Peter: The Church will never be destroyed. The faith, however, can be decimated in many communities and countries, as we have seen for decades. Great discussion Father. Thank you for your comments! We are sacramental creatures and so things like direction do matter, dear brother. Those of us not so out of touch with the rythms of nature know to look east for light, and for the new day, not toward the closest light bulb. Thus Christ who is the daystar and the light of the world has always been identified with the rising sun. This is why Yves Card Congar a heavy weight of Vatican II calls prayer “ad orientem” a Tradition with a capitol “T,” part of the deposit of faith. CAN you offer Mass facing any direction… certainly… in fact they do in the Roman Basilica’s for a particular historic reason. But a central injunction of SC and the council’s liturgical thought is that NOTHING should be changed without reason. There was no reason for the change, there is a reason for reversion, ergo faithfulness to the Council means faithfulness to the Tradition, a proposition that was never in doubt in my mind. And since we are the Body of Christ, we should all face that direction together. However that being impractical ad orientem, the Tradition of the Church will suffice. The fact that Thomas is silent on the matter demonstrates a) that it was a non-issue for the Church in his day; and b) that he personnal assented to this orientation if only by the fact that he said Mass this way each day without complaint. By the way, the picture for this article seems to be of Archbishop Josè Gomez, of Los Angeles, celebrating Mass at the Meritage Hotel Chapel in Napa, CA. Verdad? 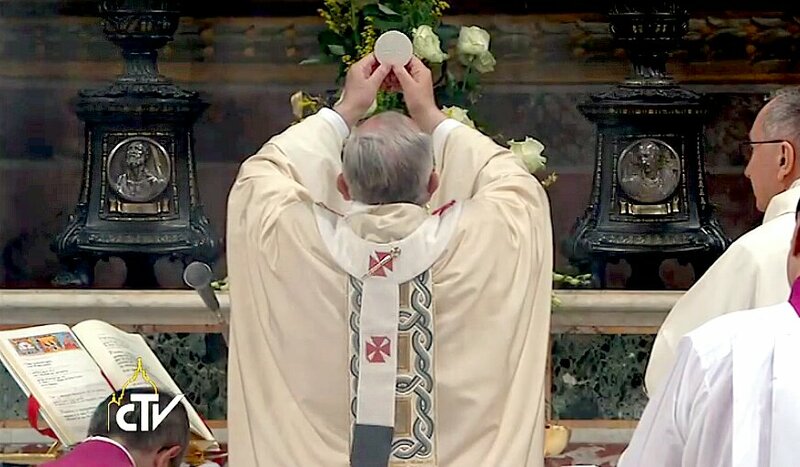 It’s actually a picture of Pope Francis offering the Mass ad orientem. I believe that’s Msgr. Marini in the bottom left corner. I work at a inner-city Catholic High School in Phoenix and daily Mass is offered ad orientem. We are the first Catholic High School in Phoenix and are celebrating our centennial next year! I find it interesting that St. Peter’s Basilica, St. Mary Major, St. John Lateran, St. Mary Trastevere and many other ancient Cathedrals and Basilicas in Rome, as well as the Church of the Holy Sepulcher in Jerusalem and the great Hagia Sophia in ancient Constantinople (now Istanbul) were all built in a way that if the Priest were to celebrate Mass (or Divine Liturgy) facing away from the people he would be facing west, not east. It would seem that the faithful may have faced the priest for the Mass of the Catechumens but then turned (as they were standing and did not have pews) toward the east. In other words, their backs would have been to the altar. Also, the organic development of the Liturgy, and of sacred architecture, then gave us the “liturgical east”…ad orientem worship with the Mass said at a high altar facing the tabernacle. Why does the priest not face the people for most of the Traditional Latin Mass? The priest offers Mass facing the same direction as the people, because he and the people together are offering worship and sacrifice to God. He is not turning his back on the people to exclude them. Rather, as a Christian community, are all facing ad orientem (i.e. toward the east) waiting in joyful expectation for the coming of our Lord Jesus Christ who will return to judge the living and the dead and the world by fire (Rite of Baptism, 1962). This quotation shows that the Christians of those early days, after listening to the homily, would rise for the prayer which followed, and turn towards the East. St. Augustine always refers to this turning to the East in prayer at the end of his homilies, using a set formula,Conversi ad Dominum (“turn to face the Lord”). Liturgical east, not literal east. After 40+ years in the NO, it is my firm believe that, although a Priest can offer Mass in any Rite, the NO is elicit (not allowed) for the Roman Rite Catholic layman. This does not mean the NO is invalid per se, but reading both the Quo Primum and Missale Romanum, it appears to be the case. Having said that, Ad Orientem is a big step in the right direction. I expreienced this celebration of the Liturgy a week ago whilst visting St Teresa’s Parish Asburn VA. I have to say I was stunned, shocked and astounded to fine such conservatism nowadays. I cannot for one moment imagine the Good Lord Jesus turning his back on his people like this. What a rejection to God’s people! This is definitely pre Vatican 2, a dangerous practice bringing the church backwards. A priest facing God’s people, whom he is called to serve, is suppose to be reaching for conciliation, which is the role of the minister, not alienation. Turning his back to God’s people does this. I have yet to ever see a painting of the Last Supper where Jesus has his back turned to his apostles. Very disturbing. I would be willing to bet that Pope Francis would have someting very interesting to say about this practice.